Kamloops is a vital transportation hub in Western Canada providing a diverse range of logistics solutions with direct links to the rest of Canada, United States, Europe and the Pacific Rim by road, rail and air. Located in the heart of the Interior of B.C., Kamloops is meeting place for the North and South Thompson Rivers and four of the province’s major highways; the Coquihalla (Highway 5), TransCanada (Highway 1), Yellowhead (Highway 5), and Highway 97. Kamloops’ strong transportation and logistics network is one of the keys to the city’s ability to attract business, but also provides visitors and residents with the connections they require to enjoy and explore the beauty of British Columbia and beyond. There are over 50 trucking and transport companies located in Kamloops that ship goods throughout British Columbia, across Canada, and into the United States. 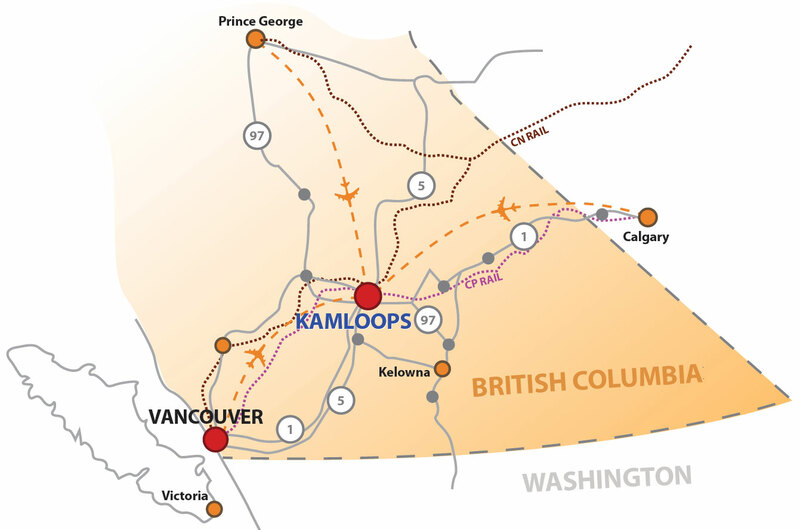 Kamloops is strategically located at the intersection of Western Canada’s four major highways: Coquihalla (Hwy 5), TransCanada (Hwy 1), Yellowhead (Hwy 5), and Highway 97. The $95 million dollar twinning and widening of the TransCanada Highway from Kamloops to Chase was completed December 2016. The Kamloops Airport (YKA) is one of the fastest growing regional airports. It is operated by YVR Airport Services Ltd. and is the main airport in the Thompson Nicola Regional District, providing air service connections to virtually every part of the world. The airport handles both passenger transport and air cargo. There is a solid industrial base, including aircraft sales, parts and maintenance, nearby at Fulton Field. Charter operations, forest service protection branch, air traffic control, ground transportation and storage hangars all operate as airport tenants. Aircraft re-fuelling and, Customs and Border Services are available. Both the Canadian National Railway (CNR) and Canadian Pacific Railway (CPR) service Kamloops with their railways intersecting in the city. Canadian Pacific Railway is a transcontinental carrier operating in Canada and the U.S. It serves the principal centres of Canada, from Montreal to Vancouver, and the U.S.’s Northeast and Midwest regions. Alliances with other carriers extend its market reach throughout the U.S. and into Mexico. Canadian National Railway’s network is a connection to North America and the world with more than 34,000 kilometres of track. CN assists in customers shipping their goods globally through the many ports they service on three coasts, or leveraging the 19 strategically located intermodal terminals across their network. The labour force in Kamloops is one that is highly skilled and many programs are available to help facilitate the specific training required to support the transportation and logistics industry. Thompson Rivers University and NorKam School of Trades & Technology offers programs such as Logging Truck Driver Training, Class 1 Truck Driver and Professional Driver Training. Other private training facilities are also available.